Attack on Titan closely follows the riveting story-line of the anime's first season and focuses on the exploits of various key characters, putting the player in a position to relive its most shocking, courageous and exhilarating moments. It revolves around the story of three young people who survive the destruction of their walled city district by enormous, man-eating Titans and eventually go on to join the Scout Regiment in order to protect humanity from this overpowering foe. Fight in a violent and relentless battlefield where the situation constantly changes from moment to moment. Every strategic decision you make will link directly to new and exciting action. Using the "Omni-directional mobility gear" created specifically for battle with Titans allows you to fly freely across and above the battlefield. It is the duty of the Scout Regiment, to which Eren belongs, to travel beyond the Wall and expand the territories of mankind. 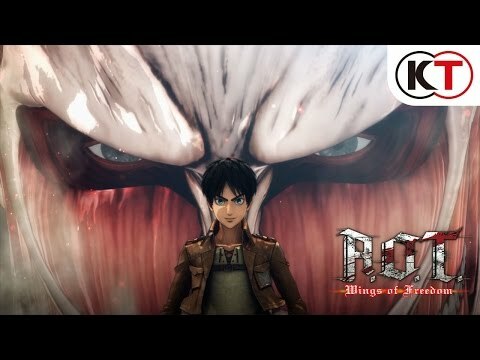 "Custom Toon Shader" - the latest graphical fusion of anime and game styles that uses physical rendering brings the rich Attack on Titan world to glorious life!